About Us｜KONOHANA Co., Ltd.｜For binding machines and binding/printing materials, contact KONOHANA. Corporate Name　KONOHANA Co., Ltd.
• From Tsuruhashi Station (JR Kanjo Line). : Office is located 100m south (about a 3 minute walk) from the Nisseki (Red Cross) Hospital adjacent to the station. • FromUehonmachi Station (Kintetsu Line): Office is located 300m southeast (about a 6 minute walk) from the station. • FromTanimachi Kyu-chome Station (Tanimachi Subway Line): Office is located 500m east (about a 10 minute walk) from the station via Uehonmachi Roku-chome. • FromSoka Station (Tobu Isesaki Line): Take a bus to Angyou Dewa (bus number 草14(So-14), about a 15 minute ride). Get off at Angyou Kitaya Chuo bus stop. The office is a 5 minute walk from the bus stop. • FromHirao Station (Nishitetsu Line): The office is a 10 minute walk east from the station. • FromHakata Station, take a bus on line 69 or 69-1. Get off at Nanokawa Eki Ni-chome (about a 1 minute walk from the office) , or Takasago Ni-chome (about a 3 minute walk from the office). 1928	Kiyoshi Mori, company founder, establishes Mori Rankei Seisaku-sho. 1945	The factory burns down during the war. 1946	Mori Rankei Seisaku-sho changes its name to KONOHANA Kinzoku Kogyo-sho and restores the war-damaged factory. moves to the current location. 1961	The new head office and factory are built at the current location. as an operating base for the Tokyo, Kanto and Tohoku areas. 1969	A new company dormitory and a new factory are built in Heguri-cho, Ikoma-gun, Nara-ken. 1973	The Printmaking Section is established and begins operation. 1975	Ikuno Factory develops a new model. 1984	President Kiyoshi Mori dies. 1984	The Fukuoka Office is established in August to quickly address the business expansion in the Kyushu area. 1986	Masaru Mori assumes the position of company president. 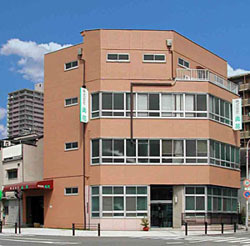 1987	Saibi Co., Ltd. changes its name to KONOHANA Seihan Jigyo-bu, and Tadashi Tanaka becomes its president. 1997	KONOHANA Co., Ltd. begins business cooperation with the SARL Pierre CALLET in France. 1998	The Tokyo Office moves in December. 2004	KONOHANA Co., Ltd. Signs a marketing alliance with ERB Corporation in Germany for drill bits. 2009	The Tokyo Office moves to Kawaguchi-shi, Saitama-ken in September.